Sunglass Fix offers the largest range of high quality sunglass replacement lenses in the world. Your lenses cracked, scratched or broken? That doesn’t mean your sunglasses have to get tossed in our ever growing landfills. With our high-quality lens replacement options, yours glasses will be good as new—maybe even better. But we don’t like to brag. Ours are industry leaders in safety, performance and durability. Each set of lenses is meticulously crafted for fit, form and function, all with fabrications that are as affordable as they are eco-friendly. With 130,000+ models available, you’ll find the perfect set of lenses to repair your perfect pair of sunglasses—fast. Still think newer is better? Check out our testimonials and see what our customers have to say. Like you they love their shades—and like you they didn’t want to ditch a good thing. Their solution? The Sunglass Fix. Ultimate Polarised Lenses - One of the strongest, lightweight and durable lenses made. These lenses integrate a Japanese polarisation film with 99.9% efficacy rating making it one of the best glare fighters around. This may be the best lens you've ever owned. Ultimate Regular Lenses - Safe, durable, lightweight and ready for action. Lenses are coated with a protective layer that resist scratching, repels water and sweat. Crystal clear glare protection when only the best can do. All Ultimate Lenses are made from a unique flexible polymer that has unbelievable optical clarity. In fact, laboratory testing ranks our lenses up with optical glass but our lenses are 1/3 the weight, don't break, are safer and easier to install. While some polycarbonate lenses claim they've got great clarity, you'll never go back to a polycarbonate lens once you tried ours. We also treat our mirrored lenses differently. We found mirroring, which is traditionally applied last, is prone to scratching. We have a new water resistant hardcoat that is applied over the mirror making the mirroring very resistant to scratches. Polycarbonate Polarised - A strong polycarbonate lens with hydrophobic external coating that makes cleaning a breeze. The lenses integrate a Japanese polarisation film with 99.9% efficacy. A strong seller and original at The Sunglass Fix. Regular Polycarbonate Lenses - Our polycarbonate lenses perform great. Polycarbonate lenses set the standard for safety because of their straight. While you give up a bit in optical clarity, they are still a great replacement lens option. ** Please note, we do NOT sell Glass lenses. We made this choice as we feel there are better technologies available today such as our Ultimate lens line. Our Ultimate lenses are safer, about 1/3 the weight, much easier to install on your own, don't break, and still provide similar optical clarity and durability you'd expect from a glass lens. They Perform: All our lenses are crafted from optically superb polycarbonate material and are coated for strong scratch protection and easy cleaning. Our lenses are 60% lighter than glass and are much safer and stronger. Safety: All of our lenses meet AS/NZS 1067:2003 and all other known regional quality and safety standards. They provide 100% UV protection so you know your eyes are being protected. The Polycarbonate lenses are made from the same primary material used in bulletproof glass and safety goggles making the lenses virtually shatter proof. Our Ultimate lenses are also some of the safest lenses on the market. However, they fall just short of the Industrial Safety standards required for safety glasses. Please note, frames also play a big factor in safety glasses. Safety lenses in fragile frames can make good sunglasses but may not provide safety required at the workplace. Durability: All our lenses have undergone industry standard steel wool abrasion testing and rank between 600-800% higher than competitors retailing for well over $400 in the shops. While glass lenses still are the hardest, they break. Therefore, we feel our combination of shatter proof lenses combined with good scratch protection and safety make for a better, longer lasting lens. 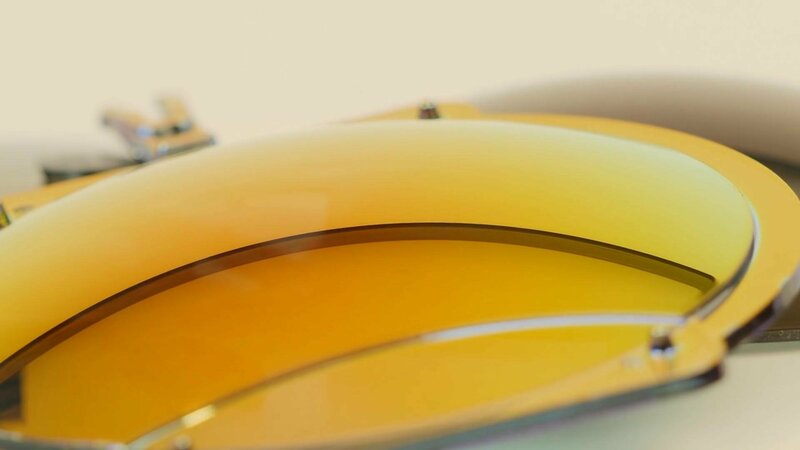 Colours and Choices: Get the lenses you want, not the ones that came with your sunglasses. We can fit most sunglasses with a choice of 10 different lenses.